Located on the Diamond Head side of Waikiki, just a block from the beach, this exceptionally kid-friendly property features one-bedroom suites that accommodate up to 5 people. It has the best recreation deck in Waikiki, complete with pool, sauna, tennis and children's playground open late, so you can enjoy it after a day of sightseeing. 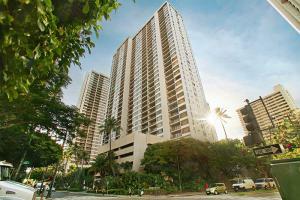 At the corner of Kuhio and Ohua Avenues, 1 ½ blocks from the beach, Kapiolani Park and the Zoo.